The Lebanese Al-Hadith news agency believes that the construction of numerous military bases in Syria by the United States is a meaningless task from the security and military perspectives. These bases are far from each other and in some cases, not more than a dozen soldiers are stationed in them. The Lebanese agency poses the question of the secrets behind the plurality of US military bases in Syria? Local sources near a US military base between the “Georud” area and the “Al-Zamir” airport in Damascus, uncovered suspicious movements and reported that numerous empty American helicopters land in said base, load something and then leave.Meanwhile, local witnesses in the area confirmed that US helicopters also move around large drilling machines that is used to explore the ancient and historical regions of the area. 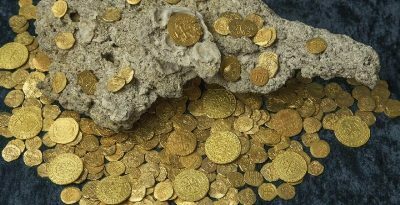 According to a Syrian antiques businessman, the area explored by the Americans is an ancient region, which was targeted by traffickers before the war because it is said that a treasure in form of gold coins and antiques (that weighs more than ten tons) is buried there. The United States, with the pretext of supporting moderate opposition, but in reality aiming to steal the ancient and historical monuments of Syria, identifies specific places for the construction of its military bases in the country.